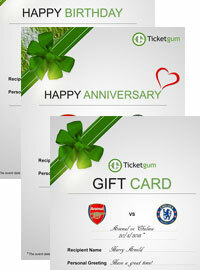 The new Premier League season has arrived and it promises to be another exhilarating season, full of twist and turns. Multiple teams have made managerial changes and added new players to their squad, with many footballers coming from different leagues across the world. Every year, this sparks an age-old debate. 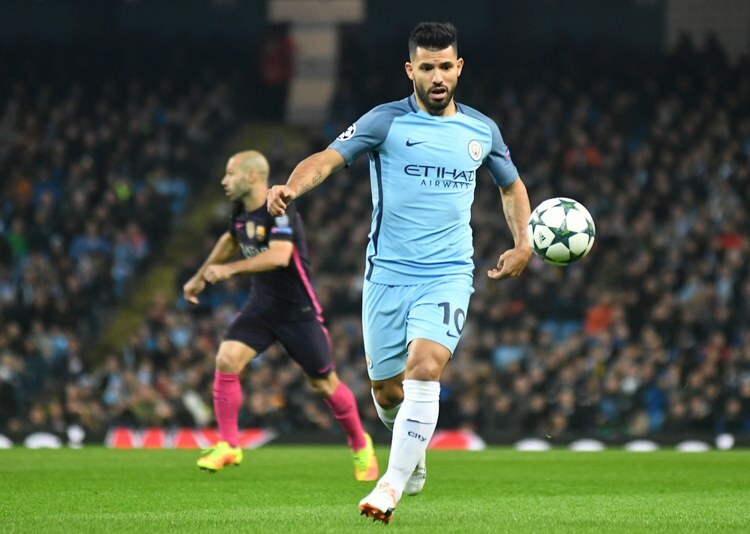 Is the Premier League too reliant on foreign talent? Historically, when looking at past dominant teams from the past that have conquered the Premier League, the spine of their teams have primarily consisted of foreign influences. For instance – Manchester United between 2006 – 2010 (GK – Dutch Edwin Van Der Sar, DF – Serbian Nemanja Vidic, MF – Portuguese Cristiano Ronaldo, ST – Bulgarian Dimitar Berbatov) or Manchester City between 2011 – 2014 (DF – Belgian Vincent Kompany, MF – Spanish David Silva, ST – Argentine Sergio Aguero). It cannot be denied that the Premier League has hugely benefited from overseas footballers. Their technical ability and drive to push teams to new levels is exhibited by iconic names like Thierry Henry (French, Arsenal), Ruud Van Nistelrooy (Dutch, Manchester United), Didier Drogba (Ivorian, Chelsea), Dennis Bergkamp (Dutch, Arsenal), Roy Keane (Irish, Manchester United), Patrick Vieira (French, Arsenal), Luis Suarez (Uruguayan, Liverpool) and Eric Cantona (French, Manchester United). Interested in foreign players, TicketGum.com utilised data from ‘CIES Football Observatory’, to calculate how many minutes from the 38 2017/18 league matches were played by expatriate players per Premier League club. The total number of minutes from all 38 matches was found to be 3,420 minutes per club. ‘Expatriate players’ is defined by the CIES as – “footballers playing in a different association from that where they grew up”. 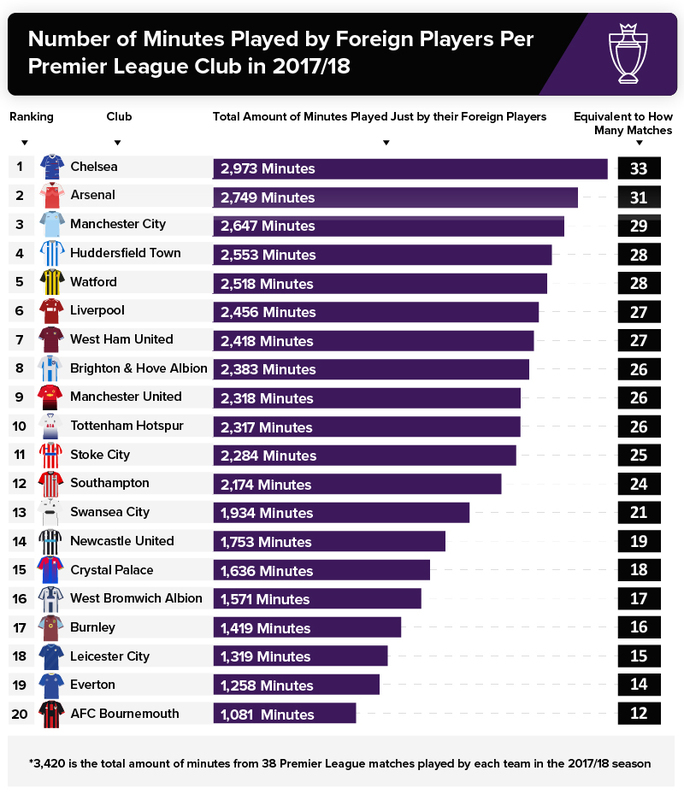 TicketGum discovered five-time Premiership champions Chelsea to be the most reliant on foreign players in 2017/18, with 2,973 minutes from a total of 3,420 played by expatriates from their first squad. This is the equivalent of 33 Premier League matches played solely by their foreign team members such as Eden Hazard (Belgium) and N’Golo Kante (France). 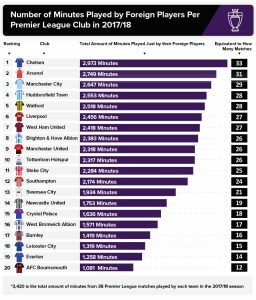 Interestingly, reigning Premier League champions Manchester City were third, with 2,647 minutes spent on the pitch by their international colleagues. 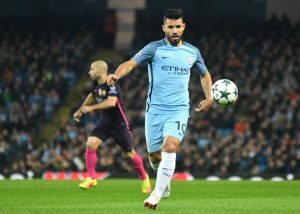 The total number of minutes played can be compared to a total of 29 matches consisting exclusively of their international stars such as Sergio Aguero (Argentina) and Bernardo Silva (Portugal). Champions League finalists, Liverpool were the sixth most dependent on their imported footballers in 2017/18, with 2,456 minutes played, equalling to 27 games played by the likes of Roberto Firmino (Brazil) and Mohamed Salah (Egypt). On the other end of the table, AFC Bournemouth was the club least reliant on foreign players in 2017/18, with a mere 1,081 minutes played by international players from their squad. Slightly above, Everton fielded more of their foreign talent – with 1,258 Premier League minutes played. Overall, out of a grand total of 34,200 minutes of football last season, 20,883 were dominated by foreign players, which is a whopping 232 games out of a total 380 in 2017/18.